When the Florida Panthers named Gerard Gallant their newest head coach last summer, many wondered what kind of an affect the hiring would have on the immediate future of struggling forward Jonathan Huberdeau. Huberdeau, who blossomed into a top NHL prospect when he played under Gallant with the Saint John Sea Dogs of the Quebec Major Junior Hockey League, had fallen on hard times after an underwhelming second season with the Panthers. After capturing the first Calder Trophy in franchise history as the league’s top rookie in 2013, Huberdeau recorded only nine goals and 28 points the following season, leaving the organization to question exactly what kind of player they had in the former No. 3 overall selection. In Gallant’s first year behind the bench, however, the 21-year-old quickly shook off any remnants of his sophomore slump to finish as Florida’s leading scorer in an overall triumphant third season in the NHL. "I feel good about myself right now," Huberdeau said following Florida’s exit meetings on April 12. "After three seasons, now I’m confident. I think next year is going to be a good season for us. For me, I’m confident going towards next year with a good summer under my belt." In speaking with Huberdeau, there’s no denying that the talented young winger certainly has an air of confidence about him. His demeanor has become that of an NHL star and he carries himself as such both on and off the ice. So how did he cultivate this newfound self-assurance? Well, according to Huberdeau, much of his development this season had to do with Gallant’s willingness to let players battle through mistakes rather than sending them to the bench to stew and exacerbate their issues. "Some coaches don’t do that, but he does," said Huberdeau, who notched a career-best 15 goals and 54 points in 79 games. "You can a mistake and then make four nice plays and he’s going to let you be on the ice for that. "Even if you make a mistake, he might come talk to you a little bit, but he’s going to give you another chance to go out there and focus on the shift and not focus on your mistake." In the final two months of the regular season, Huberdeau really began to hit his stride as the trade-deadline addition of future Hall of Famer Jaromir Jagr sparked an offensive outburst down the home stretch. In 20 games playing alongside Jagr on Florida’s top-scoring line, Huberdeau recorded six goals and 21 points to lead all Panthers. "When you make a good play he’s going to tell you to get your confidence up," Huberdeau said of Jagr. "He’s been a good guy for me." With Gallant and Jagr fueling the team’s aplomb heading into next season, Huberdeau doesn’t see any limit to what he and the Panthers could potentially accomplish together. "You’re going to make moves you usually wouldn’t do if you didn’t have confidence," he said. "I was doing it by the end [of the season] and you could tell that it changes your whole game. We all need to be confident. If we’re all confident then we know that we can be a good team." With Jagr and Aleksander Barkov doing the dirty work along the boards, it was Huberdeau who excelled as the creative speedster on Florida’s top line. With plenty of open ice to work with, he did an excellent job of finding open teammates to set up scoring chances. 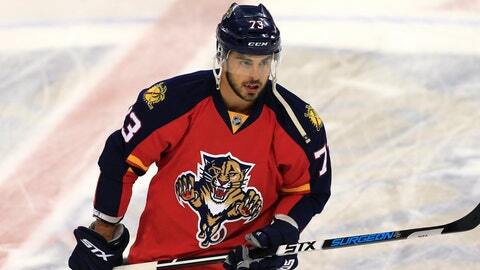 His 39 assists were the most by a Panthers forward since Stephen Weiss in 2008-09. Whenever Huberdeau scores a goal, you’re always left wondering why he doesn’t have more. He has the ability to pick even the tiniest corners with his wrist shot and his soft hands can be used to undress goaltenders with savvy dekes. His 169 shots were second among Panthers forwards last season, but he’ll need to improve upon that number if he hopes to reach the 20-goal plateau. Jan. 8 at Vancouver. Well before Jagr’s arrival to South Florida, this was the game that Gallant recalls as the turning point for Huberdeau. Honored as the second star of the game, he recorded two goals and one assist to help lead the Panthers to a 3-1 victory over the Canucks. "I started to move my feet and get more hungry around the net," Huberdeau said of the effect the game had on his season. In terms of possession numbers, few Panthers had a better season than Huberdeau. At even strength, he ranked third among Florida’s regular forwards in both Corsi For (52.39 percent) and Fenwick For (51.91 percent). Additionally, no player was better at helping the Panthers get to the power play as he led the team with 19 penalties drawn. Huberdeau enters the offseason as a restricted free agent for the first time in his career as his three-year, entry-level contract comes to an end. It remains to be seen whether the Panthers will be able to lock him up with a long-term deal or instead stave off a large payday with a bridge contract. Regardless, Huberdeau will enter next season as a cornerstone of the franchise and a legitimate threat to capture the team’s scoring title yet again. You can follow Jameson Olive on Twitter @JamesonCoop or email him at JamesonOlive@gmail.com.